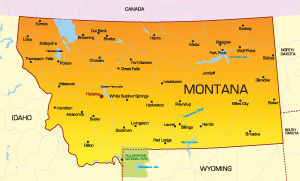 Montana is the 44th most populous state in the United States with a total population of 1 million. The name is derived from the Spanish word for mountain and the state is also called Big Sky Country. The capital is Helena but the largest city is Billings, which is home to 100,000 residents. The bordering states are Idaho, Wyoming, North Dakota and South Dakota. The major highways running through Montana are I-15, I-90, I-94, I-115, and I-315. Air travel is also possible because of airports like Billings Logan International Airport and Bozeman Yellowstone International Airport. Notable colleges in the state are the University of Montana and rocky Mountain College.